Mix 1 scoop in 250ml water and consume after awakening and immediately after each workout. Available in small version of 908g or more economical version of 2kg. 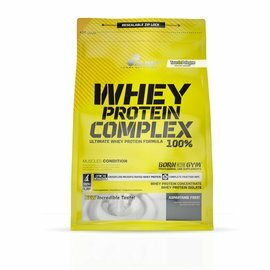 Whey Protein Matrix [89% Whey Protein Concentrate, 5% Whey Protein Isolate, 6% Hydrolyzed Whey Peptides], skimmed milk powder, Vegetable oils [Vegetable Medium Chain triglycerides (MCT) from coconut oil], Emulsifiers (Sodium carboxymethyl cellulose E466), flavourings, salt, Sweetener (sucralose E955), Colour (Tartrazine* E102). contains milk and milkproducts. May also contain traces of soy, nuts and eggs.